This accident happens when a cyclist is sidewalk riding and attempts to cross a street at the crosswalk at the same time that a car makes a right hand turn. This leads either to the cyclist being hit by the car or the cyclist slamming into the car. 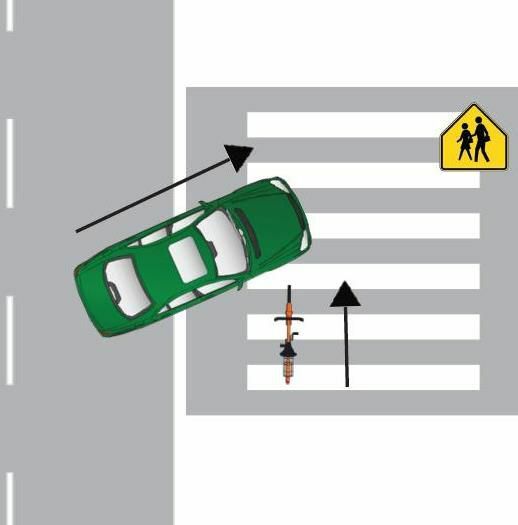 This occurs because cars are often not expecting cyclists to be at the crosswalk, even though it is perfectly permissible for them to be there. Slow down at the crosswalk. Even though it is permissible for you to be at the crosswalk, it does not mean cars will see you. As you approach the crosswalk, be extra observant of cars. Don't ride on sidewalks. Again, cyclists are permitted on sidewalks in most localities but some studies indicate that it is more dangerous than riding in the street. It is likely that the car would be at fault. Pedestrians and cyclists that are using a crosswalk legally have the right-of-way, so it is likely that the car would be found to be negligent. Virginia is a contributory negligence state. This means that if you as the cyclist are negligent in some way (e.g. going too fast, not riding at night with a light) then you cannot recover for you injuries.